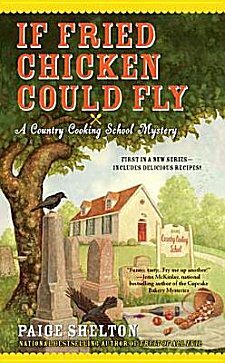 First Line: If the items in the cast-iron skillet hadn't burst into flames just as Gram was dunking the coated chicken breast into the hot bubbling grease, we might not have found the dead body so soon. Everything was going fine until then. Betts Winston and her grandmother were helping their students in Gram's Country Cooking School prepare for the Southern Missouri Show-Down-- the cook-off that begins the summer tourist season in Broken Rope, Missouri. Then that kitchen fire occurred, and Betts and Gram had to get the cleaning supplies. There in the supply closet was the body of local theater owner Everett Morningside, buried under buckets, mops, and rolls of paper towels. Everett and Gram had been seeing each other, so it comes as a shock when Everett's widow appears and accuses Gram of being the killer. It also doesn't help when Betts learns that her old high school flame is back in town and a member of the police force. Betts' grandmother is in trouble, and she's going to move heaven and earth to make sure the real killer is the one put behind bars. The school is in Broken Rope, Missouri-- a town with a very colorful past. In fact the cooking school (converted from a former bingo hall) is next to the old cemetery, a draw for tourists where several of the town's more memorable citizens are buried. That cemetery is where Betts begins seeing a cowboy that no one else seems to see, and that elusive man is going to be the one who helps her solve this case. Yes, the setting is a definite winner; the fictional town being a combination of Rolla, Missouri, and Tombstone, Arizona. Shelton has to have fun creating Broken Rope with its great old buildings and rich history. I'm looking forward to reading more books in the series just because of the setting. But of course, there has to be more to the book than its setting, and there is here. Betts and Gram are just the type of characters I love to get to know, although Gram does tend to get my back up with her stubbornness. Betts' best friend Jake, the town historian, is another character I want to know more about, and I thought the town's legal eagle, Verna Oldenmeyer, was a hoot as well as being one sharp lawyer. The other characters who own shops on Main Street as well as the ghostly presence of Jerome Cowbinder also add to a strong, vivid cast that do an excellent job in solving future crimes. The plot is a fast-moving one that involves the town's history as well as a strong glint of gold, but I'll say no more about that because the story is so much fun that I don't want to spoil it for any of you. If you're in the mood for a strong cast of characters in a fun, fast-moving plot, you can't go wrong with If Fried Chicken Could Fly. I'll definitely be visiting Broken Rope again. Sounds like a fun book and what a great title!! Paige not only writes wonderful books, she comes up with some great titles! Cathy - I love that first line! That in and of itself would be enough to make me want to read on at least a little. And I'm a sucker for well-drawn settings. Yes, this definitely sounds as though it's the start of an interesting series. I even want to know why Betts dropped out of law school, why she went to live with Gram, well you get the idea. I love all of Paige's books! And it was a great line! A perfect start to the book, wasn't it, Alicia!